Are you impressed? I certainly am, but before you all run off to buy one from your nearest PC Hardware Retailer I do have some reservations. First of all, price. The Zotac ION ITX series starts at £120 for the single core version and around £170 for the dual core version. Now, the single core version in my opinion doesn't have the grunt to really give nVidia's GeForce 9400M GPU justice and if you were to pick the single core Atom, you'd be better off spending much less on another ITX board that comes with the Intel GMA graphics and 945GC chipset instead. This leaves the £170 Atom 330 the only one in the range to consider. In a way, the price isn't so bad because you get a CPU, Motherboard, Graphics Module and Power Supply consolidated into a single solution, but what would the same buy you in the world of Micro ATX or even full size ATX? At £170, we're in the territory of CPU's such as the AMD Athlon 64 X2 7850 2.80GHz or Intel Pentium Dual Core E5200, a motherboard of choice, an ATI Radeon HD 4550 / GeForce 9500GT graphics card and just enough left over for an 80PLUS certified 400W Power Supply Unit. Such a solution would outperform the Zotac ION ITX considerably in the right applications. My second reservation lies with upgradability. Typically there aren't as many hardware releases on the Mini ITX form factor and when you're dealing with a product like this which involves so many components on a single motherboard, a future upgrade could cost a lot of money. Motherboards that include power supply units are few and far between and so it's likely that a future motherboard upgrade would require a separate power supply as well. In all fairness to Zotac however, my reservations are little to do with their splendid product as both are problems that are common to the Mini ITX form factor as a whole. Mini ITX motherboards do not sell in the same sorts of quantities that regular boards do and so they're also produced in smaller quantities too. This does not bode well for the concept of economies of scale and as a result the pricing is quite high for what it is. Upgradability on the other hand may not be a problem as those who intend on using computers that use such parts would surely not consider touching the innards of their computer at all. It would merely be a cheap tool that'll be used for a couple of years before being thrown out. I am however beginning to sit on the fence here and so a conclusion must be made. There's no getting around the fact that even with some very capable embedded CPU's and Graphics chipsets, Mini ITX will always cater to a niche market. Mainly those who put a value on having a very compact computer and at least the Zotac ION 330 ITX can offer levels of performance that are actually very close to that of a desktop computer. For what the overall package offers, Zotac have offered much better value for money compared to other solutions on the market and on that note, I can quite confidently say that this is the best Intel Atom Motherboard on the market today. 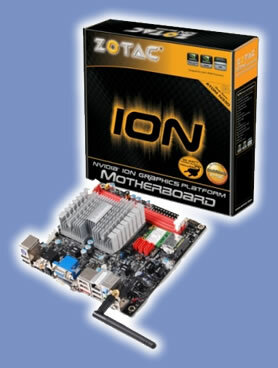 Very well done Zotac for offering yet another fabulous Mini ITX motherboard! −	A more “heavy duty” cooler may have allowed for passive use. −	The ION 330 would be a far better buy nearer the £125-150 mark. Thanks to Zotac for sending the ION 330 ITX in for review. Discuss this review in our forums.